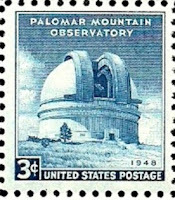 The Palomar Mountain Observatory, with its art deco designed Hale Dome can be found near San Diego. Inside the dome is a 200" telescope that was first used by Edwin Hubble. 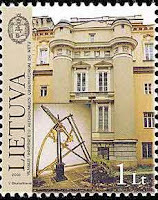 This 2003 stamp from Lithuania celebrates the 250th anniversary of the Poczobut Observatory of Vilnius. It was the fourth observatory in Europe when it was built in 1753 on top of one of the Vilnius university buildings. By the 1960s there was too much light pollution and a new observatory was built about 70 kms north of Vilnius. The original building still does scientific research. I *almost* chose 'outer space' for today. Glad to see you did. 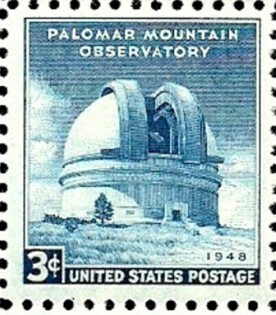 Observatories are such interesting buildings, great to see them on stamps. I would never have though of outer space or observation. Glad you did.